Visio has been a trusted tool in diagramming for more than a decade. And we know its visual communication in the form of diagrams will become more powerful when anyone in the company can consume—regardless of their location or device. 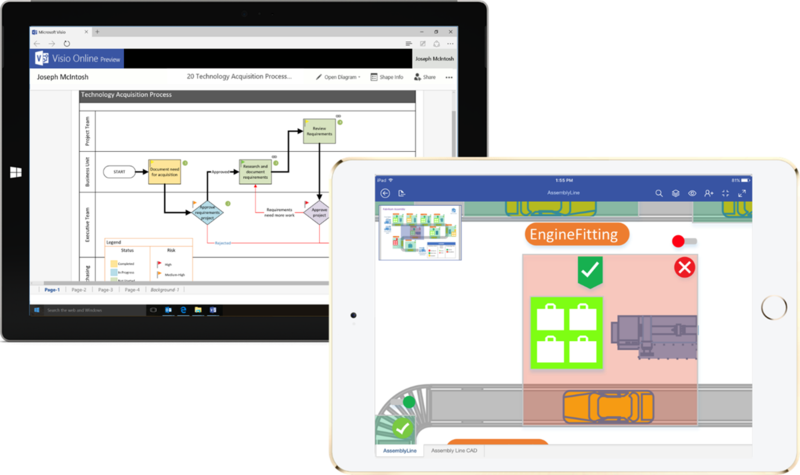 So, today we’re excited to announce Visio Viewer for iPad and Visio Online Preview, enabling users to share or access diagrams from nearly anywhere, gain operational insights and explore real-world diagrams easily. As one of the most widely adopted process mapping tools, Visio helps thousands of organizations blueprint the business processes that drive their desired transformation. Using Visio Online Preview and Visio Viewer for iPad, you can securely store your diagrams in OneDrive for Business and SharePoint Online and easily share them with anyone as a link—allowing your colleagues to view and interact with diagrams effortlessly across devices. The Visio desktop has always been a powerful tool for creating network maps, organizational charts, business processes and more. Visio Online Preview amplifies the power of visual communication by helping teams glean real-time information from diagrams with just a browser—turning your data-linked diagrams into an operational dashboard that more employees can access. Picture a network map that the IT department uses to manage the company’s global datacenters. As a static diagram, the map is perfect for understanding how different servers interact and show the location of those servers. Now, pairing that map with real-time data, IT admins can see things like server outages as they happen. You can use hyperlinks to bring in additional documentation, such as policy guidance created in Word. Or, moving from the network dashboard to the rack dashboard for a specific server performance, IT admins are able to drill down to the root cause of the outages and take the appropriate actions to keep the business up and running. See the Visio Online Public Preview FAQs to learn how to access the preview. Using the Find pane, you can pinpoint all occurrences of a shape name, text or data—eliminating the need to sift through countless shapes. After you locate the shape with your desired metadata, smoothly navigate through your diagrams and zoom in and out with intuitive Pan and Zoom features. You can even reveal different visualizations of the same diagram by adjusting the visibility of certain layers. For example, an architect can share the same building layout with Facilities and HR, who can then visualize the respective layers which contain only the electrical map or personnel location for their own functional need. Operations managers can add an inventory visualization layer on top of a production line with throughput information to understand the root cause of a station breakdown. You can download Visio Viewer for iPad today. We’ll bring Visio to the iPhone in the coming months. Visio is continuously innovating to meet the ever-changing needs of today’s digital transformation, starting with robust cross-platform capabilities. Please visit our UserVoice site to give us your thoughts and feedback on the Visio Online Preview, Visio for iPad and other innovations or capabilities that are important to you.